In the developed world, measuring gender equality often means looking at the pay gap. But what happens outside the workplace can also provide insight into how the genders differ, and a new report suggests that there’s still a huge imbalance in housework. Women do more routine housework than men in all of the 29 countries surveyed by the Organisation for Economic Co-operation and Development (OECD). 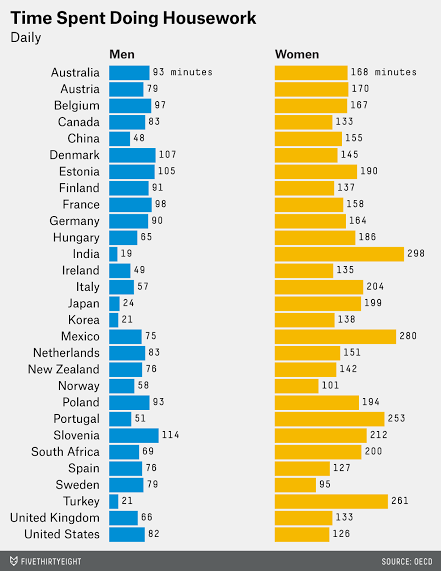 A lot more housework — an average of 173 minutes per day, compared to just 71 minutes for men. Slovenian men are at the top in chore equity, followed by the men of Denmark and Estonia. At the other extreme is India, where men spend just 19 minutes each day cleaning. To compensate, their female compatriots do more cleaning than women in any other country: Five hours each day. The survey reveals other differences between how men and women spend their time. Men, on average, sleep 9 hours and 33 minutes each night, while women get about 8 hours and 30 minutes of shut-eye. Women spend 7 minutes 39 seconds taking part in “religious/spiritual activities and civic obligations” each day, while men spend 5 minutes 48 seconds doing the same.